Namratha.. The bride with beautiful garlands.!!! A beautiful smile is one of the most precious ornaments of a bride.!!! 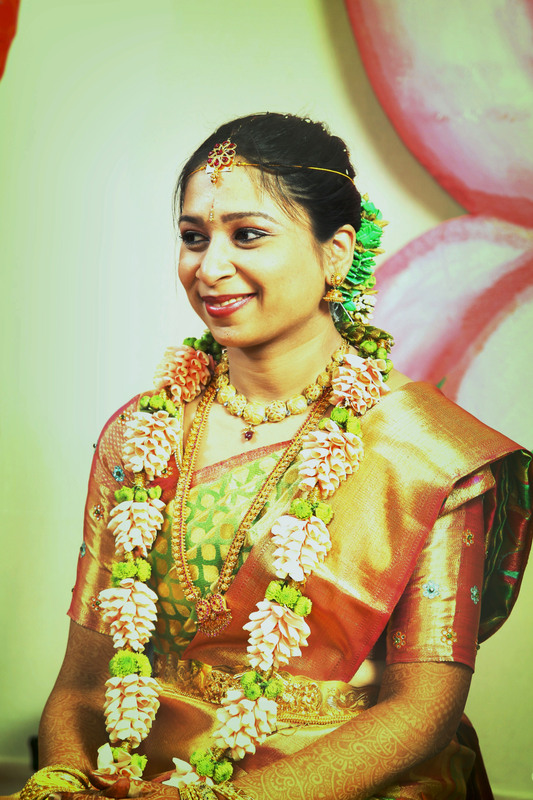 Meet Namratha Jayachandran.. A very creative and clear headed bride. While planning her wedding, she was very specific about the garlands to be used. While discussing with her and her mom, we were fascinated by the level of their creative thinking. They were so much passionate about flowers. She was wearing a parrot green Saree. So we made her Muhurtham garland with pale pink rose petals and green Chrysanthemums. The Maatrumaalai was of Whole pink roses with white Chrysanthemums made into a spiral around. She looked absolutely stunning. I think her beautiful smile added beauty to the flowers. For the reception,she wore an Ink blue silk saree and diamonds.!!! She chose a very subtle decor. 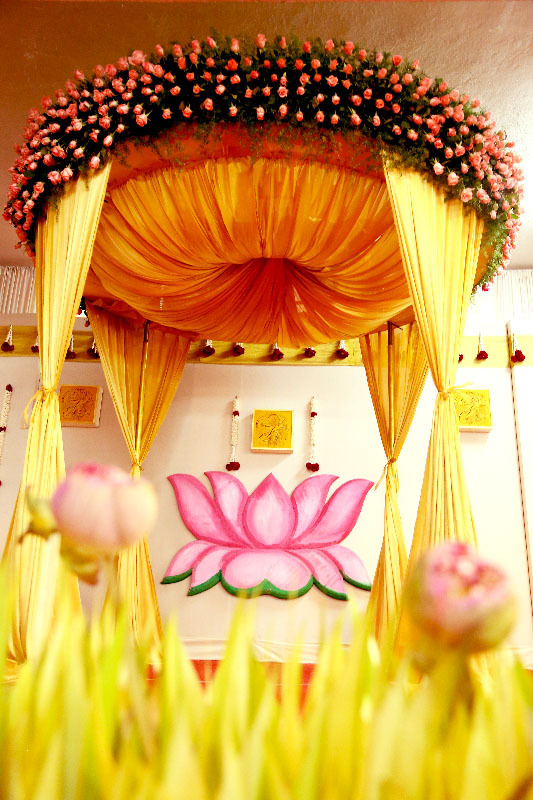 A semi traditional setup.Lotus themed backdrop and a round fashioned mandap with pale pink roses was arranged by us. Previous Post The Big Fat Indian Wedding..!!! 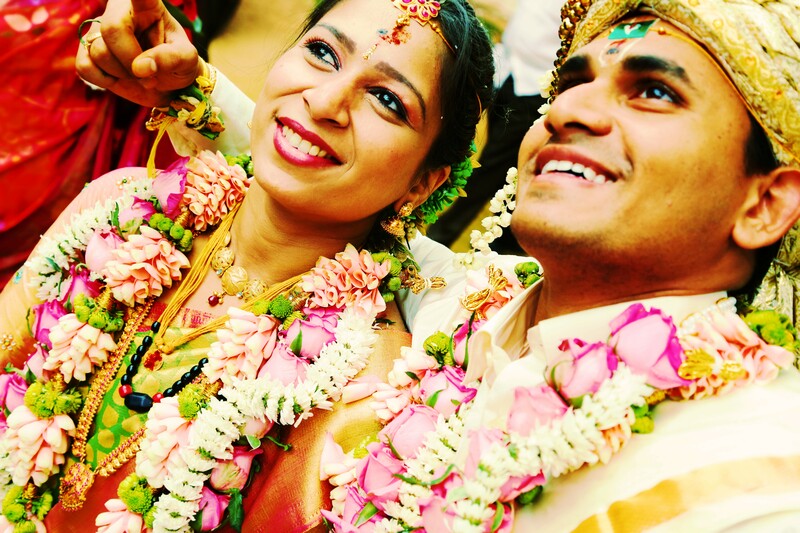 Next Post A wedding at Brindavanam..
Beautiful photographs. Thanks for your stylish fashion tricks.